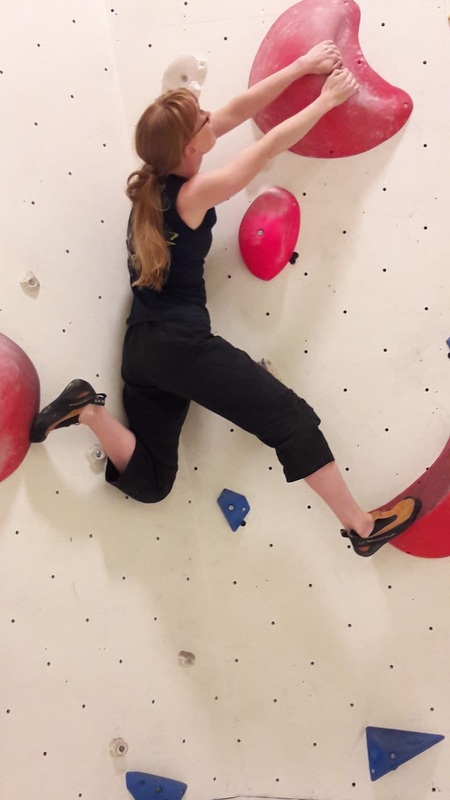 And here are finally the pictures of my new climbing trousers in action! Some day, I should ask a third person to either take pictures or belay, so I can show off my me-made sportswear when lead climbing (or, more likely in Dutch climbing halls, toprope climbing). Both of those involve climbing on high walls. The climber wears a harness with a rope attached to it for protection and to lower him/her down after reaching the top (in a toprope set-up, those ropes are hung from anchor points at the top of the wall, when lead climbing you take them up yourself, fixing them to the wall at about 2 to 3 meter intervals). 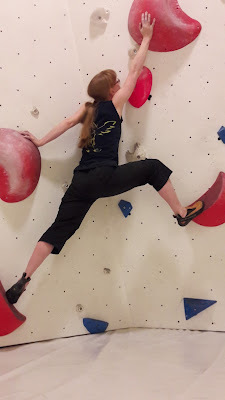 Where clothes are concerned, both bouldering (climbing on low walls with thick mats on the floor for protection, which is what I am doing in these pictures) and sport climbing require a huge range of movement but the boulder does not have to consider the fit of clothes under a harness. Anyway, in this picture, I am not really trying to climb the boulder properly but you get to see both my outfit and the bouldering wall. In most of the other pictures, you can see my design choices are working out: I can bend my knees without baring them and thanks to that gusset, I can get my legs in any position I am capable of, without being held back by my clothes. I'm happy with these, I guess I'll have to make some more! Nonclimbing bystander question: would there be any special features that would be useful in climbing clothes to compensate/work with harnesses? Padding, technical fabrics, more durable fabrics that might be abraded by harnessing? The harness consists of a waistband and leg loops (which are connected, of course) which are usually padded. 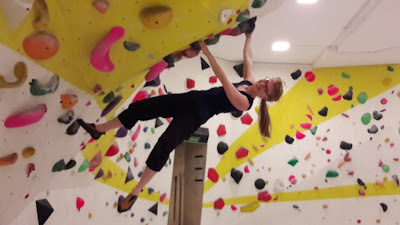 While climbing, you don't really put pressure on it, only when hanging (because you've fallen or because you've reached the top and are being lowered). When setting or removing routes, you are hanging in your harness most of the time and even then, it takes hours before it gets uncomfortable. And as for durable fabrics: moving along rock and/or rough indoor walls or holds causes much more wear and tear than wearing a harness. And that happens in both climbing and bouldering. Oh, and there is one manufacturer of climbing gear, Mammut I think, who produce climbing shorts with an integrated harness. It's a cool idea but I would never ever try to make safety gear on my own normal sewing machine.